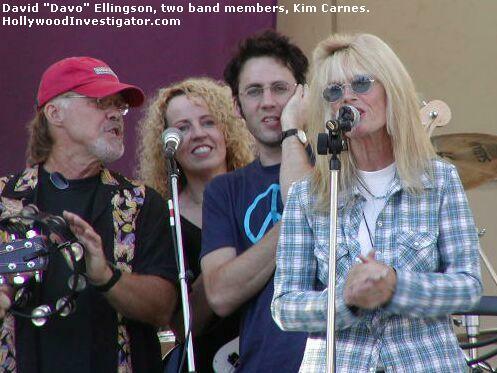 [HollywoodInvestigator.com] Twenty-two years after the release of "Bette Davis Eyes", Kim-crazed fans traveled 1000s of miles from around the world to glimpse singer/songwriter Kim Carnes, who performed at the Valley Cultural Center in Woodland Hills, CA, on July 27, 2003. Country crooners Greg Barnhill and Matraca Berg also appeared, performing both solo and duets with Carnes. Best known for her Grammy Award-winning 1981 hit single, "Bette Davis Eyes" (from her Mistaken Identity lp), Carnes's nearly four-decade showbiz career began with a 1965 acting gig on TV's Patty Duke Show, followed by a deluge of critically-praised albums released both before and after Mistaken Identity, songwriting (often with longtime hubby, David "Davo" Ellingson) for Kenny Rogers, Frank Sinatra, Barbra Streisand, and Neil Diamond -- among many others! -- plus 1000s of live performances at venues big and small! And Carnes continues to draw 1000s of Kim-heads from around the world! In an exclusive email exchange, Valley Cultural Center CEO Jim Kinsey informed the Hollywood Investigator that he estimates that up to 6,000 fans attended Carnes's 2003 appearance -- bringing photos, CDs -- and even vinyl albums from the 1970s! -- desperately hoping for Carnes to sign them! The Hollywood Investigator has also learned from well-placed sources that during Carnes's 2000 appearance at the Valley Cultural Center, a female fan from the Brazilian Kim Carnes Fan Club flew in from that sunny but distant land -- just to see Carnes! This so moved Carnes that, after the concert, she greeted the lucky Latina Kim-maniac backstage! FUN FACTS: In a 1980s interview, Kim Carnes said that one of her favorite films is Black Orpheus (1959) -- set during Rio de Janeiro's Carnival! The film also provided inspiration for Carnes's 1981 music video, "Draw of the Cards" (by "Bette Davis Eyes" director Russell Mulcahy). But for all the Kim-crazy excitement of the 2000 concert, the 2003 concert proved even bigger, as Carnes opened with "Break the Rules Tonight" (also from Mistaken Identity), then shared numbers with country's Greg Barnhill, who also performed solo. 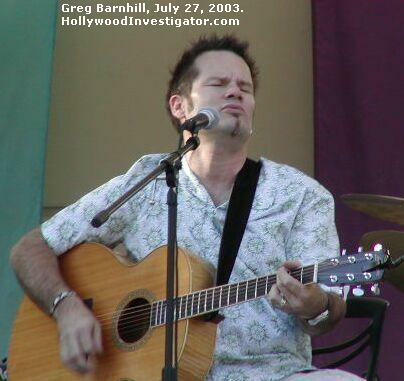 Although born in New Orleans, today Greg Barnhill, like Carnes, lives in Nashville. His songwriting includes the Grammy-nominated "Walkaway Joe," recorded by Trisha Yearwood and Don Henley in 1993. Also like Carnes, Barnhill has written and sung for film & TV soundtracks, and turned his towering talents to acting -- he appeared in "American Duet," a musical by playwrights Marcus Hummon and Bill Feheely. But it was Carnes who ruled the evening, as oceans of Kim-aholics begged for requests throughout the concert. Carnes tried to please all, but when one fan shouted for "Crazy in the Night" (from Carnes's 1985 Barking at Airplanes album), Carnes apologized, explaining that the band didn't know it. "I'll do it next year," Carnes promised, "when the band's had a chance to learn it." Then, trying to soothe the fan's heartbreak, Carnes sung the first few verses without musical accompaniment -- and appreciative Kim-heads of all ages roared adoring approval! After Barnhill, Matraca Berg performed with Kim, and also performed solo! 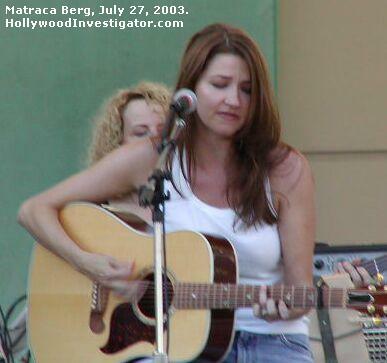 Born in Nashville, Matraca Berg is the daughter of country songwriter and session singer Icee Berg. In 1983 Matraca Berg's "Faking Love" (co-written with Bobby Braddock) was recorded by T.G. Sheppard & Karen Brooks -- and became a #1 hit! In 1990 Berg released her first album, Lying to the Moon, with the Top 40 hit "Baby, Walk On." She followed with Bittersweet Surrender (1991) and The Speed of Grace (1993). Berg's also written songs for Trisha Yearwood, Suzy Bogguss, Reba McEntire, and Pam Tillis. At one point during the concert, Berg had a special treat for Berg-heads! She called out for her hubby from backstage, who took over Barnhill's stool while Barnhill slipped backstage -- and Berg & hubby performed duets! But then tragedy nearly marred the concert! When Berg & hubby were done, hubby left, and Berg shouted for Barnhill to return -- but he didn't! Carnes joined in calling for Barnhill's return -- but still he did not return! Tension mounted as anxious Barnhill-heads worried over the fate of their idol! Finally, after six seconds -- that seemed like eight! -- Barnhill rushed back out on stage -- his mouth full of food! "Sorry!" said Barnhill. "There's a lot of good food back there!" "Yes, that's true," Carnes told a relieved audience. "There is a lot of good food back there!" Although the concert began at 6 pm, Woodland Hills -- nestled in the infamously white-hot San Fernando Valley! -- was still sweltering from the fiery July afternoon California sun, and Carnes & company drank often to keep cool! Yet despite the torrid temperatures, the concert lasted till well past 8 pm! "I'm glad they scheduled us for six," Carnes told the audience. "Last time we started at four. This is so much better." Yet despite all the previous Kim-inspired ecstasy, it was a mixture of joy and grief that gripped the audience when Carnes began singing "Bette Davis Eyes," as longtime Kim-watchers knew that her signature song signaled the end of the concert. Afterwards, as Barnhill-heads barnstormed Barnhill's Barnhill CD tent, and Berg-heads did whatever Berg-heads are wont to do, oceans of Kim-heads trounced onstage to get backstage for autographs and photo ops with their idol -- and Carnes complied with their requests! Everyone wanted to pose with Kim -- even her longtime friends! And not only did Kim-heads get to see Carnes in the flesh -- they got an inside peek at all the good food provided by the Valley Cultural Center! One Kim-giddy fan -- who flew in from Kansas City just to see Carnes! -- told the Hollywood Investigator -- in an exclusive statement! -- that meeting Carnes was the most exciting event of her life, gushing, "It was wonderful to talk to her. She is a wonderful person. Very nice. I loved the music and the atmosphere was great!" Another Kim-head endured a grueling 100 mile roundtrip drive, bubbling, "This was my third time to drive to Woodland Hills to see Kim. I loved it! I met Kim each time she's performed there! She's beyond friendly! I have been very impressed as to her humility!" Shockingly, this Kim-head is also a Berg-head! "I've liked Matraca since her first release. At the first concert I saw of Kim's, Kim made mention of Matraca as the writer of a song she was going to do. I was in front, and did a 'woo hoo.' Kim looked at me and said, 'So you know Matraca? Great!' "
Even more shockingly, this Kim-head/Berg-head is also a Barnhill-head! "When I saw Kim in 2000, it was my first exposure to Greg Barnhill. He's great live -- and his guitar playing is awe inspiring to me!" But despite all the good food, much of the Kim-O-Ramic joy was shattered by grief and despair -- because infinite numbers of Kim-maniacs were unable to attend the concert! In the weeks before the concert, high-level traffic burned the internet with the heart-rending missives of Kim-heads wracked with crippling agony over the darkly foreboding prospect of not seeing Carnes in Woodland Hills! To soothe the grief of Kim-heads unable to attend the 2003 concert, the Hollywood Investigator offers this exclusive insider backstage candid peek of Kim Carnes looking at the good food provided by the Valley Cultural Center. You will not see this in the National Enquirer -- or in any other major media outlet! 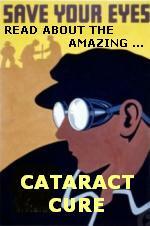 Only the Hollywood Investigator is able to provide this "you are there" opportunity to our hugely vast family of readers! France was another nation torn between Kim-mania and Kim-grief, as a French listserv member wrote: "You see, nobody want us, we are all alone and far away!" Perhaps in a desperate attempt to reach across the Atlantic, she attached an image of her electric guitar to her email. It is not believed that this image was ever seen by Carnes. But the Hollywood Investigator has seen this image! -- and can report that this Gallic guitar-head's electric guitar is white. FUN FACTS: "Carnes" is a French name! Kim Carnes's dad -- who had the same name! -- was a Los Angeles-based corporate attorney. Perhaps in honor of her heritage, Carnes went on to sing "Paris Without You," which appears on her St. Vincent's Court (1979) album. Last April, the Hollywood Investigator reported exclusively on Kim Carnes latest CD project -- which she is self-producing in Nashville! 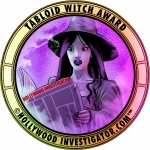 The Hollywood Investigator has now exclusively learned that the CD is still in development -- and that Carnes has a very special message to her fans! "She said she was going to finish the album," reports a source close to Carnes, "and then figure out how to distribute it. Then [Carnes] said: SPREAD THE WORD ABOUT THE NEW ALBUM!" The Hollywood Investigator will continue to stay on top of breaking developments as this story unfolds! 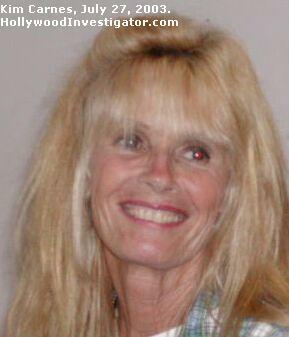 KIM CARNES RESOURCES: (1) Kim Carnes Official Website, (2) Brazilian Kim Carnes Fan Club. (3) Kim Carnes Fan Listserv. Also learn about Greg Barnhill and Matraca Berg and the Valley Cultural Center -- famous for its good food!